View detailed information about boating services, fishing charters, and other marina services in Staten Island. 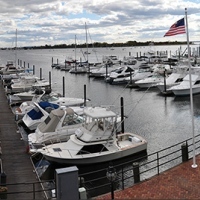 See our complete directory to marinas in Staten Island. If you're planning a weekend on the waters, explore one of these great marinas on Staten Island. One of the Best Marinas in Staten Island, NY! Atlantis Marina & Yacht Club is located on the west shore of Staten Island's Great Kills Harbor, only 15 minutes from the Verrazano Bridge and Sandy Hook by water. The full-service marina contains floating docks for 140 boats ranging from 18-100 feet, with a holding tank pump out station for your convenience. If you own a personal watercraft, the marina also contains 30 flotation slips. Additional marina services include a 38-ton travel lift, 2 full-time mechanics on staff, a marine supply store, yearly slip rentals, boat and water sport repairs, storage, hauling, and mooring. Within walking distance are three great local restaurants and a grocery store. If you're planning a party or corporate event, Atlantis' party affiliates will cater to all your needs. You provide the guests and Atlantis will provide the tents, chairs, furniture, catering, entertainment, and decor.